(Bloomberg) -- For active managers who spent the year’s first two months rediscovering their superpowers, March was kryptonite. Stock-picking mutual funds have watched it all turn tragic over the last four weeks, with two-thirds trailing benchmarks, upending the strongest start to a year since the bull market began. Blame it on a loss of nerve. In a market that kept trudging upward, they bailed on the winners. Now, only 36 percent of large-cap portfolios are ahead of indexes like the Russell 1000, when more than 50% were in February, data compiled by Jefferies Group LLC show. And the industry, which after February was poised for its best result in a decade, is hobbling toward another humiliating year. Viewed in terms of opportunity lost, the blow gets worse. 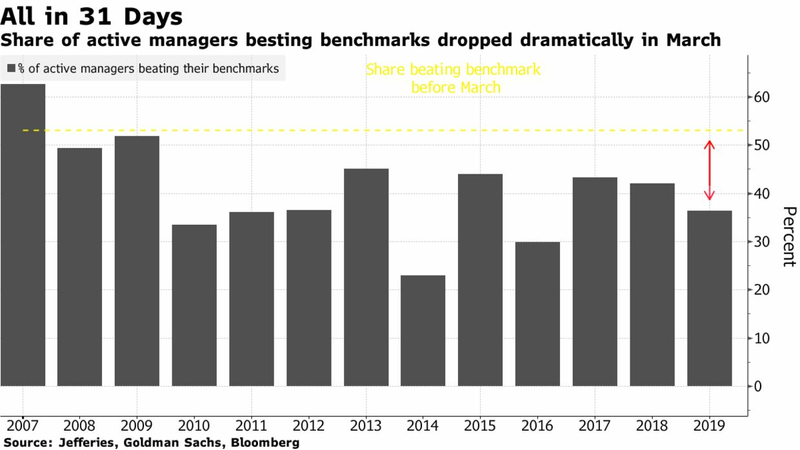 March’s results threaten to choke off a resuscitation for active managers who’ve suffered for years as passive funds attracted more cash. The worst Q4 since the financial crisis left an opening to reassert their prowess. Instead, they find themselves trailing the same exchange-traded funds that got clobbered in December. In a stock picker’s market, the issue has been the stock picks. At exactly the wrong time, the average manager became enamored with defensive industries like health-care, when he should’ve been buying technology and real estate. Anyone in that trade saw his wings clipped at mid-month when the Federal Reserve turned even more dovish on rates. To see the culprit, look not at what they owned, but what they didn’t. 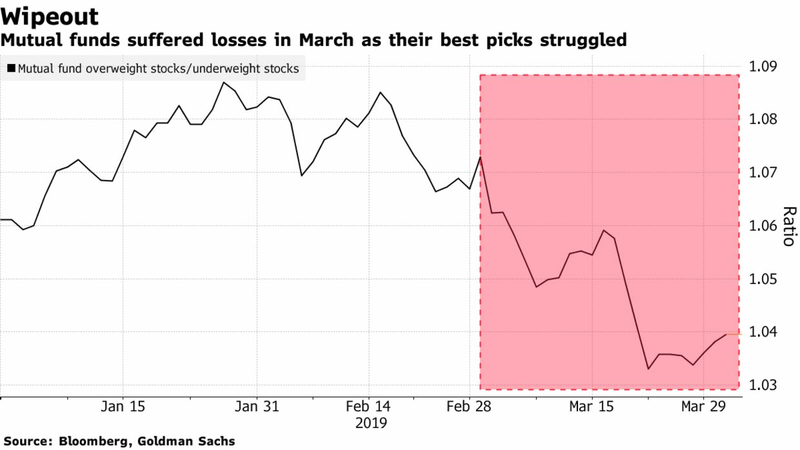 A Goldman Sachs index tracking stocks most favored by mutual funds was virtually flat in March, but a similar measure of the least owned shares rose 3 percent. Should large cap managers’ underperformance continue, it would mark the 12th straight year that they lost to their benchmarks, according to Jefferies. “When the market’s really running, it’s really difficult to beat the straight up market,” said Jay Pestrichelli, founder and CEOof ZEGA Financial, which manages around $400M. Jefferies blamed much of the trouncing on a lack of active manager affinity for real estate stocks, March’s second-best performing sector. Shunning technology companies also hurt. Entering the third month of the year, mutual funds had cut their tech exposure to a three-year low, Bank of America data showed. Yet tech firms surged 4.8% in March, more than any other area. What managers do own hasn’t helped, either. Active exposure to industrial shares rose to the highest level in five years at the end of last year, according to Goldman Sachs. While that bet paid off in the first two months of 2019, the luck ran out in March, as machinery and equipment makers were one of only two S&P 500 sectors that notched losses. Health care, also a beloved area, has continued to lag too. For the more mathematically inclined, the best performing quant strategies also backfired in the past month. Of the five best-performing factors tracked by Evercore ISI in 2019, four incurred losses in March. Factors like growth, momentum, and value are increasingly being affected by macro forces such as the yield curve and oil prices rather than style-specific forces, and investors should “focus more on the macro outlook” when building positions, according to Dennis Debusschere, head of portfolio strategy. To be sure, the year is still young. 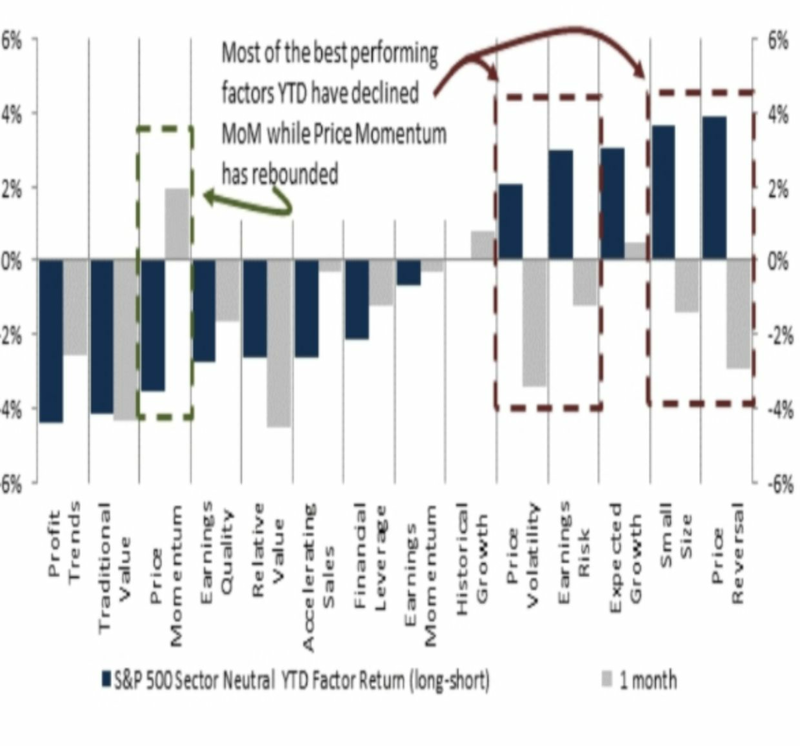 Active managers still have time for redemption, but then again performance could also worsen. “Can active come back for the remainder for the year? It’s always possible, but it’s a little difficult to predict in advance just because a lot depends on what happens with the macro environment,” said Lisa Erickson, head of the traditional investment group at U.S. Bank Wealth Management.